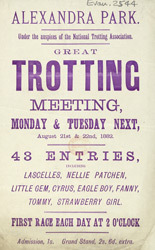 This advert is for a meeting of the National Trotting Association. The Association probably regulated events like Harness Racing. In this event horses trot at speed whilst pulling a one seat, light, two wheeled vehicle, called a sulky, around an oval shaped track. This was more popular away from London and Alexandra Palace appears to be the only venue in London itself.